The Raptor Paddock was located in Isla Nublar’s restricted section. 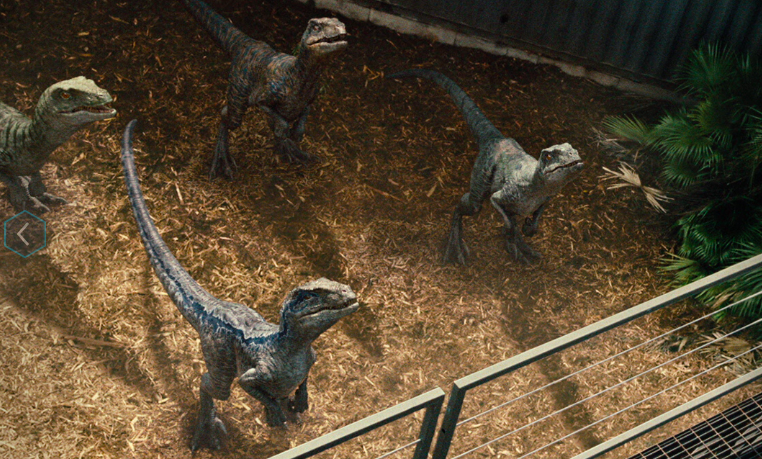 During the Jurassic World incident there were four Velociraptors housed in the paddock. This paddock was specially built to contain and house Velociraptors as part of the secretive I.B.R.I.S. Project. The compound was on the eastern side of the island, located near steep cliffs. The paddock consisted of a titanium octagon in the middle of a large clearing. The clearing around the paddock area had multiple shipping containers for storage as well as a small covered area to the side that could act as a makeshift office. There were two stairwells near the entrance of the paddock that provided access to the a walkway along the top of the octagon area. This walkway also included a cross sectional walkway bisecting the paddock so that guards could observe the animals from relative safety. The paddock’s primary entrance was a large steel cage, which had safety doors on either end. First, a paddock worker would have to unlock the first cage, lock it behind them before they unlocked the second to gain access to the paddock. This second door could close via remote within the steel cage for safety reasons. There was also a separate steel cage, wherein the handler’s could directly interact with the raptors without needing to enter the paddock. This area utilized steel muzzles to restrain the animals so that they could be handled or tested by park staff if needed. There was an additional area of the paddock, ‘stables’ in which the velociraptors could be housed if a transfer between paddocks was needed. This could be opened remotely so that safe removal of a solitary animal could be attempted. 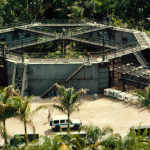 During the Jurassic World incident, the four raptors housed in this paddock were Blue, Charlie, Delta, and Echo. They were being trained to determine if they could successfully resist killing on command, the test subject being a pig. Owen Grady rewarded them with a snack for their success, while Vic Hoskins congratulated him. As Owen headed towards the steel cage entrance, Vic Hoskins described his plans for military applications of the velociraptors in some detail, causing an argument. However, a newly hired staff member, Leon, fell into the paddock distracting the raptors. Owen was forced to enter the paddock, and was able to hold Blue, Delta, and Charlie at bay long enough for Leon to escape. Then at the behest of Barry, he narrowly escaped in time. Owen then gave Leon a lecture about the velociraptors, warning him not to underestimate them. The paddock is seen again when Barry was attending to Delta during routine medical treatments. Vic Hoskins arrived and attempted to convince Barry about the military applications of the raptors. 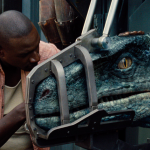 Further conversation was disrupted by the news about the Indominus Rex breakout, and while Barry went to attempt to resolve the issue, Vic Hoskins immediately informed an unknown party over the phone that his plans were coming to fruition. Owen Grady returned to the paddock later that night, with Claire Dearing, Zach Mitchell, and Gray Mitchell. 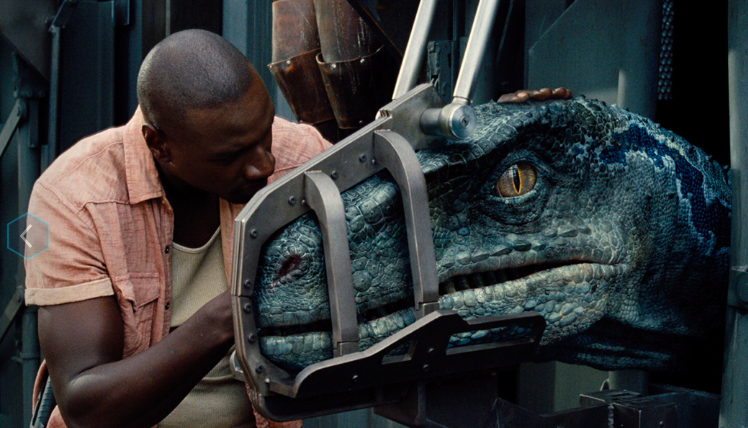 Initially attempting to stop Vic Hoskins from utilizing the raptors to track the hybrid, he compromised on the condition that he would lead the hunt. Owen Grady worked with Vic Hoskins and the ACU in the nearby shelter to devise a plan for how best to approach the Indominus. Owen later introduced Zach, Gray, and Claire to the raptor paddock and the raptors. He reiterated to them that they were dangerous and untrained. As the Ingen soldiers made preparations for releasing the raptors, Claire Dearing and her nephews took shelter in a nearby ambulance. The velociraptors were released, and the InGen team proceeded to hunt the Indominus Rex. 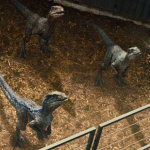 A short while later, the Velociraptors returned, now allied with the Indominus Rex. They killed some of the InGen soldiers stationed at the paddock, including one who was attempting to hide in the ambulance. The vehicle sped away from the attack, leaving the raptor paddock behind.